Climate Change Theatre Action 2019 is Just around the Corner! Climate Change Theatre Action 2019 is just around the corner. 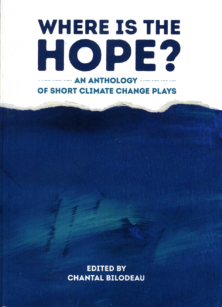 Once again, we’re bringing 50 new climate change plays by 50 international playwrights into the world. We’re lighting the way and imagining together how to create the just and sustainable future we all deserve. To get the project underway, we need to raise $15,000 by December 13th – our most ambitious campaign yet! – so we can commission our playwrights. We would love for you to become part of this amazing community of changemakers. Can you chip in $10, $25, $50 or more? Every contribution level gets you some cool perks that we have lovingly put together for you as an expression of our gratitude. This is an all-or-nothing deal: either we reach or goal, or we get no money at all. Please contribute generously and help us spread the word by sharing this campaign with your networks. Are you with us? 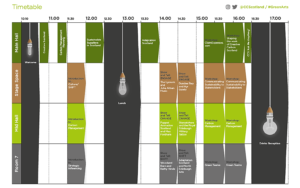 Full Programme for Green Arts Conference! With just two weeks to go until our conference for Scottish cultural organisations, we’re excited to announce the full programme for the day! Share the Programme – and tell others you’re coming – using #GreenArts! 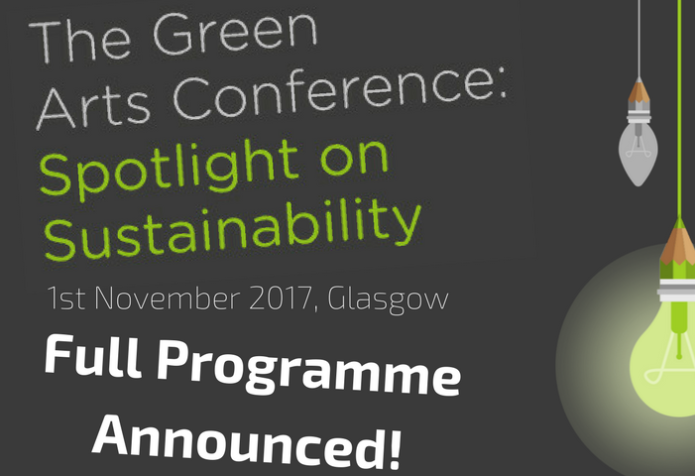 With speakers, sustainable suppliers and attendees from across Scotland, a mix of presentations, ‘show and tell’ sessions and workshops, it’s essential for any cultural Green Champion to attend. We’ll be hearing from national funding body, Creative Scotland, on what is coming for the sector around sustainability, as well as hosting several sessions on carbon management– soon to be required of all Regularly Funded Organisations. We’ve expanded our popular ‘show and tell’ sessions to hear from more Green Champion peers in the sector, discussing a huge range of sustainability initiatives taking place across the country: from Ayr Gaiety to the Barn, Puppet Animation Scotland to the Royal Edinburgh Military Tattoo! These 15 minute talks will be sharing everything from how to reach international standards of success, to how to raise funds for sustainability projects. 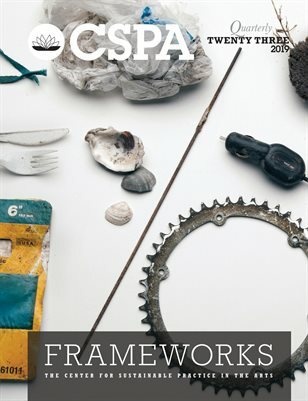 Delving into the wider context of the work of Green Arts organisations, we’ll share the expertise of some of the most sustainable suppliers in the country, before hearing from the national organisation for responding to the impacts of climate change: Adaptation Scotland. New to this year’s conference, we’ll also be running a series of short, practical workshops on key skills for Green Champions: everything from how to build an internal group to expand your capacity, to using the tools to support your carbon management. Finally, we’ll be topping off the day with a drinks reception for all attendees! 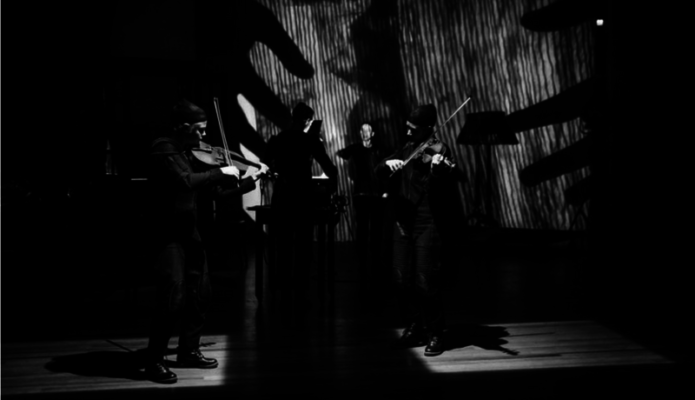 You can also join us in attending the opening night of Sonica Festival’s ‘Shorelines‘ with a special discount code for Green Arts Conference-goers! The Green Arts Initiative is supported year-round by carbon neutral print company, PR Print and Design, and the Green Arts Conference will also be showcasing some of the best sustainable suppliers in the country: Take One Media, the Green Stationary Company, Resource Efficient Scotland and Vegware! If you have any questions about the event, think you have something you could share with other attendees, or fancy a conversation on arts and sustainability more generally, get in touch! The Green Arts Initiative is supported by carbon neutral print company, PR Print and Design. If you would like more information about our range of sponsorship opportunities, please contact catriona.patterson@creativecarbonscotland.com. The post Full Programme Announced for Green Arts Conference! appeared first on Creative Carbon Scotland. We are pleased to announce a special offer for registered (and not-yet-registered) attendees for The Green Arts Conference. Cryptic, a member of the Green Arts Initiative, is offering a discount to attend the opening night of their climate-change-themed music/theatre production Shorelines, which follows directly from the conference drinks reception at 7.30pm on November 1st at Tramway in Glasgow. Shorelines is part of Sonica 2017, and has strong sustainability themes, exploring the impacts of a natural disaster, and mankind’s relationship with the natural world. As part of the Green Arts Conference this year, we’ll be exploring the artistic programming emerging along such themes (including hearing from artist Kathy Hinde, also part of Sonica 2017), and this is an opportunity for you to see some of it for yourself. 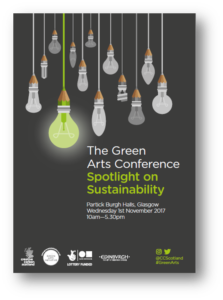 The Green Arts Conference: Spotlight on Sustainability is crafted specifically for those working on sustainability in organisations in the cultural sector, and those interested in the intersections between the arts and sustainability. This full-day conference will explore current best practice, and deliver practical, hands-on workshops on topics such as travel recording; staff green team engagement, and carbon management planning for arts organisations. Perfect for green champions in the arts, screen and creative industries, and for members of the Green Arts Initiative. Delegates for the Green Arts Conference can get tickets for Shorelines on 1st November for £8 (instead of £15), contact us for details. The post Sonica 2017 special offer for Conference attendees appeared first on Creative Carbon Scotland. 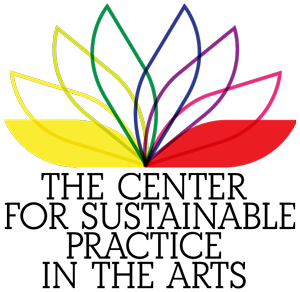 The Organising Committee invites you to attend the Conference Cultura/Natura 2017. This meeting welcomes both scientific and artistic contributions, from all areas of knowledge, and considering the diversity of artistic formats, that embody or reflect on this theme. This is an initiative of Teatro do Frio in partnership with the Faculty of Psychology and Education Sciences of the University of Porto (FPCEUP) and the Centre for Research and Intervention in Education (CIIE/FPCEUP), and in association with the A Oficina (Centro de Artes Mesteres Tradicionais de Guimarães) and the Directorate-General of the Arts. The deadline for submissions of abstracts is Thursday 15th June 2017. Reflect about the potential and limitations of adopting creative and dynamic models of artistic creation, in the pursuit of sustainable cultures. Reflect about the potential and limitations of adopting models of scientific consensus, in the construction of sustainable cultures. Open an experimental space where artists, scientists and other knowledge producers could share, connect and expand experiences, projects and dialogues in different fields of arts and sciences. Promote communities of learning, practice and mutual support between researchers. Promote experiences of interdisciplinary hybridisation. Whether in the form of artistic dramaturgies built from scientific, philosophical, environmental, socio-economical stimuli (amongst others), or in the form of methodological procedures that address the diversity of forms and artistic practices, this encounter is conceived as an experimental site, in which, during two days, we will dedicate ourselves to the exploration and enhancement of dialogues between arts and sciences. If you are interested in delivering a paper, please submit your paper abstract by midnight on Thursday, 15th June to the email culturanatura2017@gmail.com. Abstracts should not exceed 400 words (excluding references, if any: max. 10 references). A short biographical note (fewer than 200 words) for each author must be included in the submission. All papers will be fully refereed. We aim to notify acceptance decisions on 17th July 2017. Works will be selected for inclusion in a publication launched in March 2018. If you have any issues please contact: culturanatura2017@gmail.com. The importance of tackling climate change and promoting environmental sustainability has been accepted at the highest levels of government, from the United Nations Framework Convention on Climate Change through to the EC’s European Climate Change Programme. In December 2015, a new international treaty on climate will be negotiated setting a path for the next decades to come. There has been considerable interest and growing engagement around such issues in the cultural and creative industries. This has ranged from high-profile champions in fields such as film and music, attempts by leading businesses and cultural institutions to reduce their carbon footprint, environmental policies developed by funding and strategic bodies, and a plethora of artistic work engaging the public directly. These activities are generating demand for a “green” creative economy, and a supply chain is emerging that is helping to create the conditions for real systemic change. Optional excursion on the weekend 11-12 June 2016. The course fees is 1,000 Euros. This covers the cost of the course, accommodation (single room, in 4* hotel), breakfast and lunch-pack per day. This is not inclusive of travel costs to Thessaloniki, or any per diem compensation. Institutions are encouraged to undertake the cost of fees and travel for applicants. Julie’s Bicycle and The Tetley invite you to join us for a conversation around environmental sustainability in the arts. What does a sustainable future look like for the arts and culture? 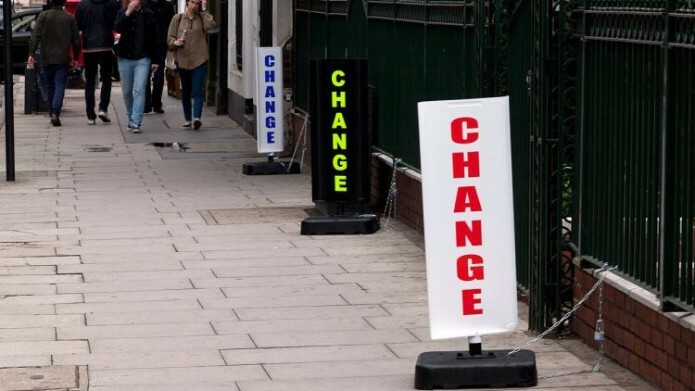 What kind of leadership do we need to galvanise change? How can we work together to create a strong and resilient sector? Ahead of the UN climate talks (COP21) in Paris this December, Culture and Sustainability brings together cultural leaders, arts organisations and practitioners to share knowledge and experience, and discuss our collective response moving forward. Julie’s Bicycle and Arts Council England will launch the latest results from our Environmental Sustainability partnership, sharing insights on how the arts and culture are addressing and benefiting from environmental sustainability, and what role the creative sector will play at COP21. The panel discussion and Q&A will be followed by lunch and afternoon themed breakout sessions. Laura McFarlane-Shopes | Coordinator, Leeds Tidal – For the Love of Yorkshire festival takes place throughout November and December and is a county-wide programme of climate-related activities and events. The day will include ample time for networking and discussion, so you can come away with a sense of purpose and action. After the main event we are inviting ACE NPOs and MPM organisations to a free focussed surgery on environmental action planning and the reporting requirements and process for April 2016. A dramatic art exhibition inspired by climate science. See through icy veils of mesh as art and data come together to create past, present and future forms of life. Wonder at physical and virtual models of life forms as they evolve. Discover your genetic ancestors in the algae that photosynthesise light to make the energy that sustains us. Immerse yourself in an exhibition that challenges your senses with artworks that combine scientific and sensory knowledge of climate change. 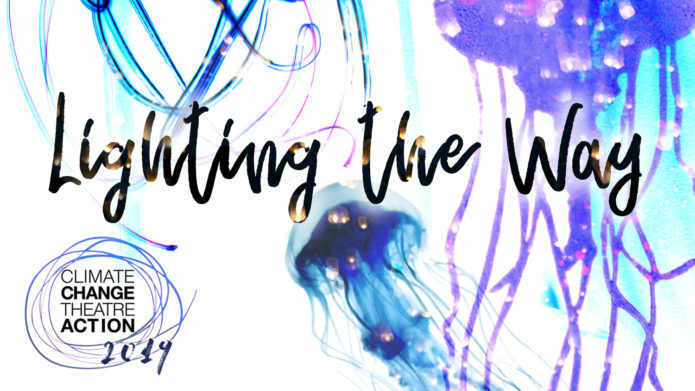 Curated by Dr Lisa Roberts, Living Data program leader and Visiting Fellow at the University of Technology,Sydney, you’ll have a chance to take part in ground-breaking art and science talks, see dramatic climate-inspired dance and hear primal music. Dr Roberts is a multimedia visual artist whose work combines scientific and sensory knowledge of climate change. Her formal studies include dance, visual arts, animation, Indigenous perspectives and Antarctic perceptions. Lisa Roberts is the great grand daughter of the prominent Australian painter Tom Roberts. What do we know about climate change and how are we responding to it? There’s a lot of talk about the need for collaboration between cultures, disciplines and institutions, to develop a sustainable future, but not a lot of time to build trust to share the data, stories, hypotheses and images to inspire and enable action for change. For the 2013 Ultimo Science Festival, scientists, artists and designers come to Sydney from as far away as Antarctica to contribute what they know about climate change and how they are responding to it. Dr So KawaguchiPrincipal Research Scientist at the Australian Antarctic Division (AAD) and Manager of the AAD Krill Research Program. Theatre is a process of reinvention, making and remaking. How do we consider the resources that go into bringing something to the stage? What is our responsibility to materials and energy? How do we create efficient spaces that house performance? How do we talk about this, both as artists and in our art? 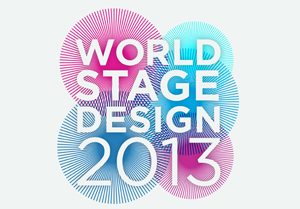 These questions are the focus for the Sustainability Programme at World Stage Design 2013. Join designers, architects, researchers and others who are focused on the intersection of sustainability and performance as we explore the future of our field as it relates to one of most vital issues of today. You can view the full programme and book online for some events here. More events will be added throughout the summer, so keep checking the website. The People, Profit, Planet programme is supported by the Waterloo Foundation. These workshops and presentations are for anyone interested in considering the issues of sustainability within their work. Curious about how reused and eco-materials impact design and construction? Or the future of new energy efficient lighting technology? Intrigued by new work that explores issues of social justice and the environment? Interested in tools and best practices to monitor the carbon footprint of your facility or productions? Perplexed by how these tie together? Join us for a cross section of programming that highlights performances, place and interconnectedness in the wider world. Sustainability is important for everyone working in design today, but to be sustainable is also often required by your clients. What is real sustainability and can the energy saving in theatrical lighting save the world? Exploring what to do, and what not to.